For aquarium enthusiasts who keep bettas, it is usually the male fish that are known as the "colorful ones." Oftentimes the males are favored over the females, not only for the color but because males have longer tails and more dominating personalities. But this doesn't mean that the females are all drab, colorless fish. 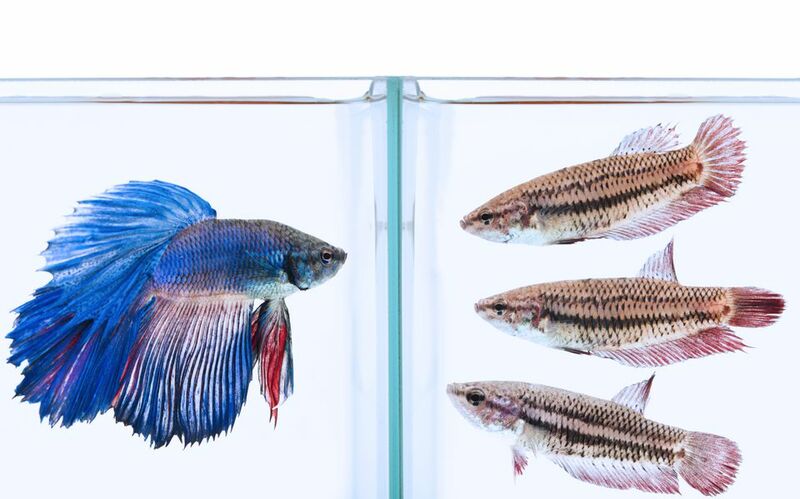 Nevertheless, female betta fish are lovely, colorful, and anything but boring! This photo gallery features different colored female bettas, taken by their breeder, Daniella Vereeken. This is a traditional plakat yellow dragon female—a variety of betta with shorter fins. Because of its shorter fins, this variety is also known as a short-finned fighter. In certain parts of the world, these fish are actually bred to fight. Males of this variety are bigger and thicker, with a gill beard that drops down below the chin. Females lack this feature and are smaller and thinner. The term plakat is from the Thai word plakad, which means "fighting fish." The term also applies to other strains of betta fish. Here is another plakat betta, but this one is a bright red hue. Many plakats are more active than the long-finned version of bettas because they aren't held back by excessive flowing fins. This type is also quite resistant to disease, making it a favorite among betta collectors and pet owners. The half-moon plakat features the shorter fins typical of the plakat variety but has a tail shaped like a half moon. When these traits are combined, it produces a fish that can still zoom around in the water even though it has a partially flowing ornate tail. This silvery half moon plakat displays the signature shorter fins of the typical plakat betta and the half moon's tail. HMPKs can come in various colors and are available as either males or females. Because they are relatively durable betta varieties, pet owners prefer this and other types of plakats. Here's another half moon plakat betta, this one with a coppery sheen to her scales. This particular color of HMPK betta shows all the colors of the rainbow in subtle tints within the metallic sheen. The half moon bettas were developed by Peter Goettner, an American breeder. This variety is not as aggressive as the plakat and is slightly more difficult to breed. Half moon males are bred for fuller tails, which have a wide span and flowing shape. The female exhibits a more conservative tail that earns its name because of the half-moon shape. This brightly-hued red half moon butterfly betta is recognized as a butterfly because of the distinctive bands of colors on the tail and fins. For this red female, the darkest tinge begins at the base of her tail and fins and extends until it reaches a band of silvery white on its edges. Also sometimes known as a fringetail, the crowntail plakat owes its name to the fin rays that give the tail the appearance of a crown. Full crowntails have longer fins and tails, but this plakat variety has the typical crown-shaped tail but with the shorter fins of the typical plakat.